Need a hit toddler activity? Make up some bubble foam in seconds! I love bubble foam. Foam, foam, foam. 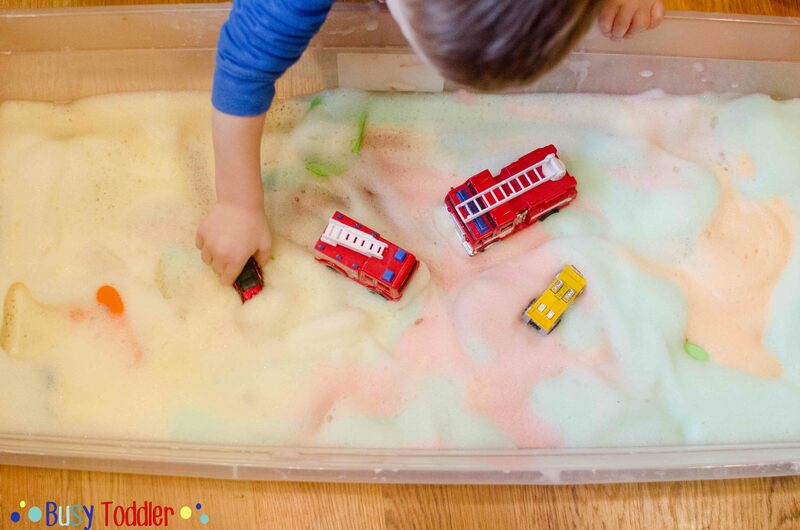 Sorry ’bout that, I just really love this stuff – it’s one heck of a good toddler activity. And it’s a good thing my toddler loves it or I’d have to just sit and play with it alone. Looking for more fun activities to do each day? Check out my activities program Playing Preschool: 190 days of at-home learning. 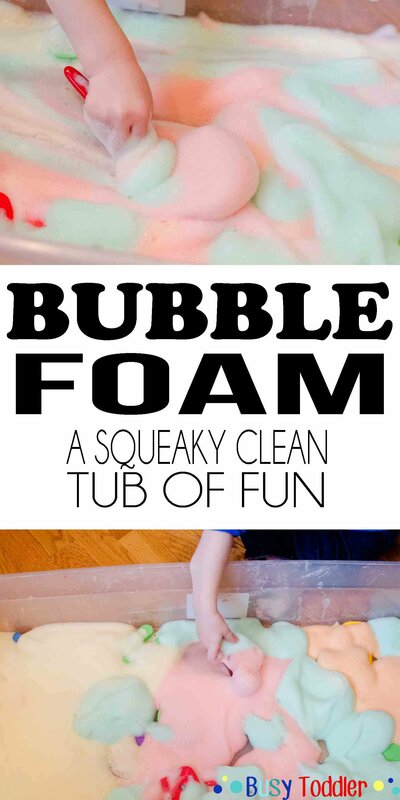 Bubble foam is so easy to make, so clean to play with (seriously! I promise!) and a great “how are we going to make it through today?” type toddler activity that you can decide to do on the fly. Let’s talk about what it is: It’s just bubble bath and water, whipped together. 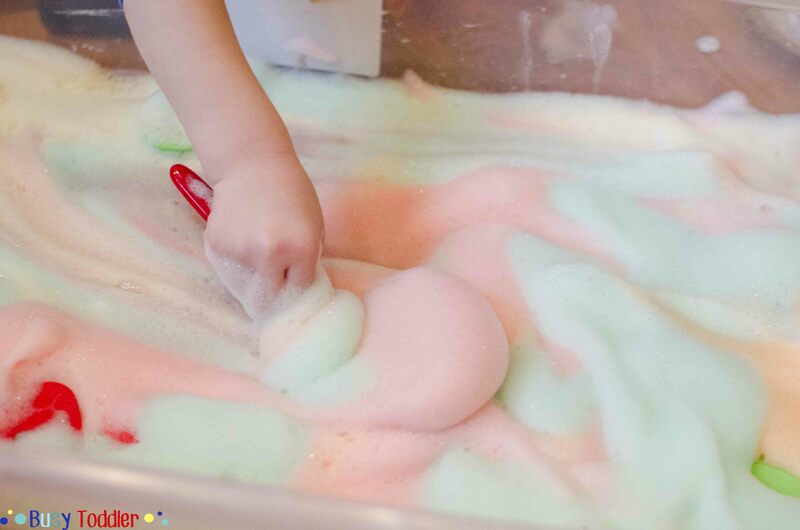 Some recipes I’ve seen online use dish soap or washing up liquid to make the bubbles, but that stuff is not tear free and trust me from experience – it’s not right for our toddler crowd. You’re gonna want to use something tear free. Mix 2 parts water to 1 part bubble bath. I wanted to make rainbow bubble foam so I went with 1/2 cup water + 1/4 cup bubble bath for each of my small batches. For color, I added a little food coloring then whip it with a hand mixer on med-high for one minute. Use a big bowl (trust me) and you’ll end up with stiff peaks. You’ll just “know” when it’s done and ready. If you’ve ever made whipping cream, this it’s similar to that concept. This rainbow bubble foam was the best! Usually, I make one batch for my toddler and let him play in a dry bath tub with it. The day I took these pictures, I was feeling especially foam generous and made FOUR batches so we could have rainbow bubble foam. It was totally worth the small amount of effort because it was completely awesome to play in that much foam. I dumped each batch into our messy activity staple: under the bed storage tub. That little tub actually worked great as a Foam Box (like a clean sand box). For kicks and giggles, I hid my toddler’s foam letters in the bubble foam and let him dig them out. We scooped the foam and flipped it with kitchen utensils. We drove cars through it. 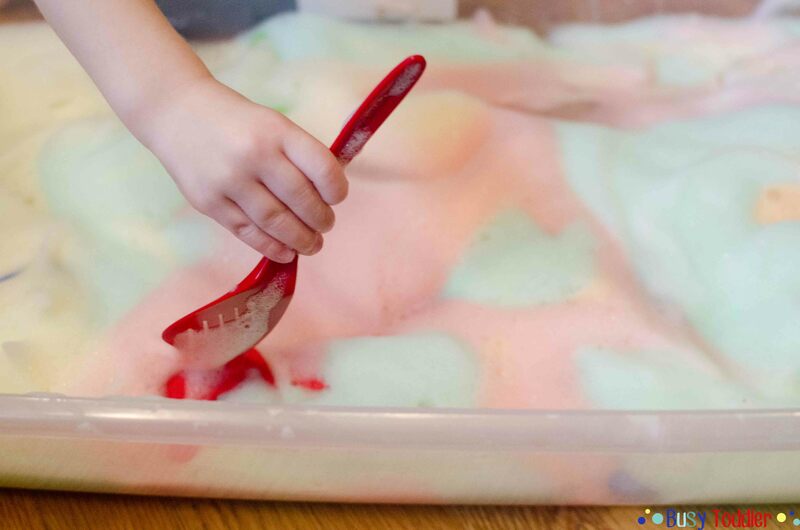 We rinsed foam off in a bowl of water because my toddler loves to make things clean. 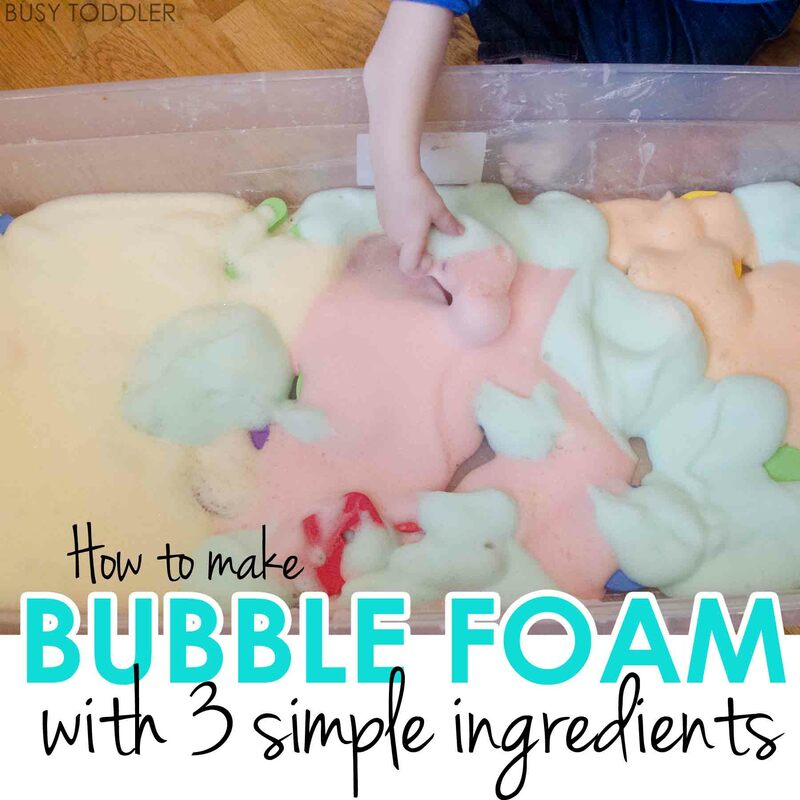 Bubble foam is such a fun and versatile toddler activity. Sometimes, we even play with it in the bathtub! This kept my toddler so busy! Did I mention this held his attention for more than 30 minutes? I got so much done while he played and it was heaven. 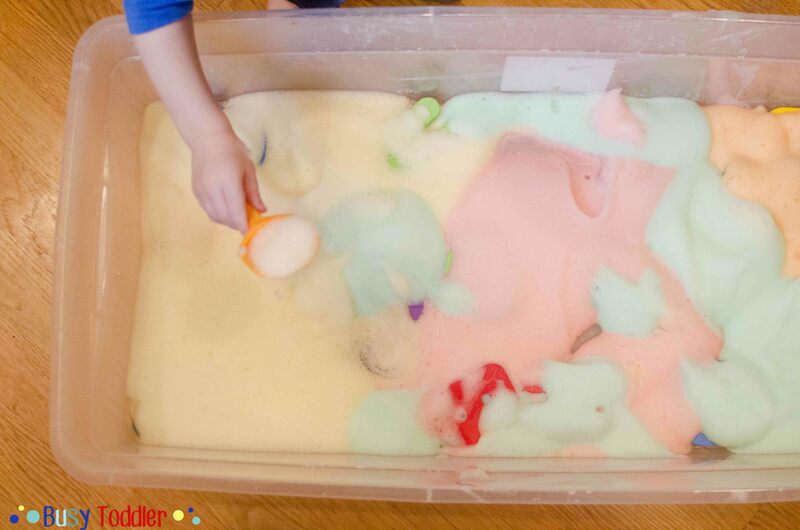 My toddler had a fabulous bubble foam time and so did I. Everything wiped up squeaky clean with a wet rag and the storage tub rinsed out easy peasy. In the end, it’s just soap and water! Try out bubble foam someday when you need a little pick me. It’s great in a storage tub. It’s amazing in an empty bath tub too (just watch the slippery factor). 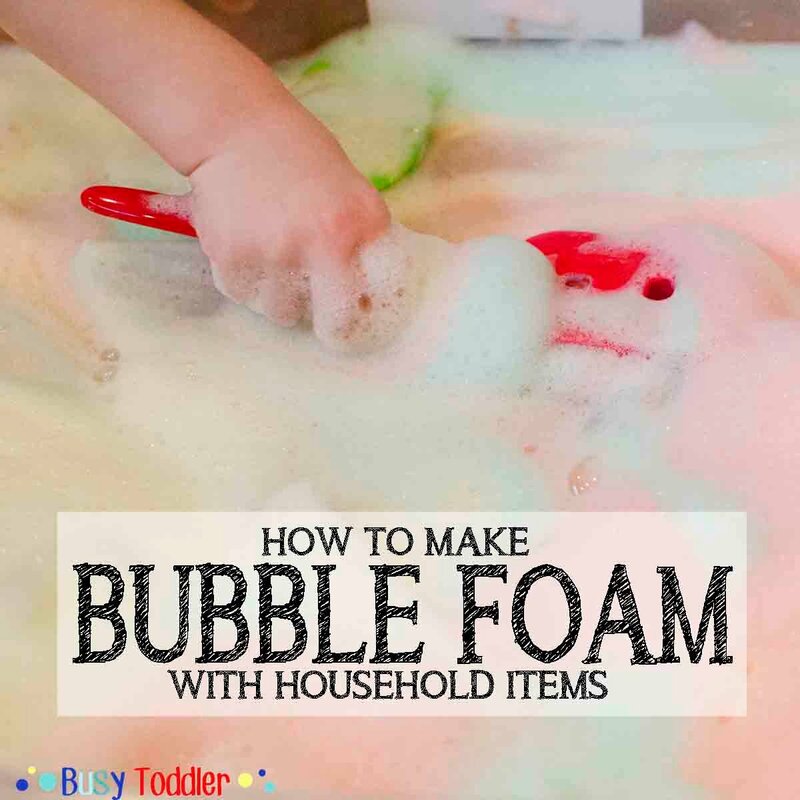 Think your toddler would love to play with bubble foam? Will you try it? I love this and so easy! I think Ellie will totally be into this. I’ve never seen this before! It looks so fun! And I know both of my kids would love it! So pretty! We need to give this one a try. Kiddo might even clean in the process, lol! Thanks for sharing at the Thoughtful Spot! Does the food coloring dye the kids? I work in a day care and am looking for things to play with. How long approximately would you say it lasts before it reduces completely to water and soap again? If this were made for more than one toddler to play with at a time? Is it normal for the separation between water and foam after around 15 minutes that the foam no more in color ? Mine usually only lasts about 15 minutes before the bubbles turn back into water. This looks amazing! i work in a nursery and have recently become a key worker! 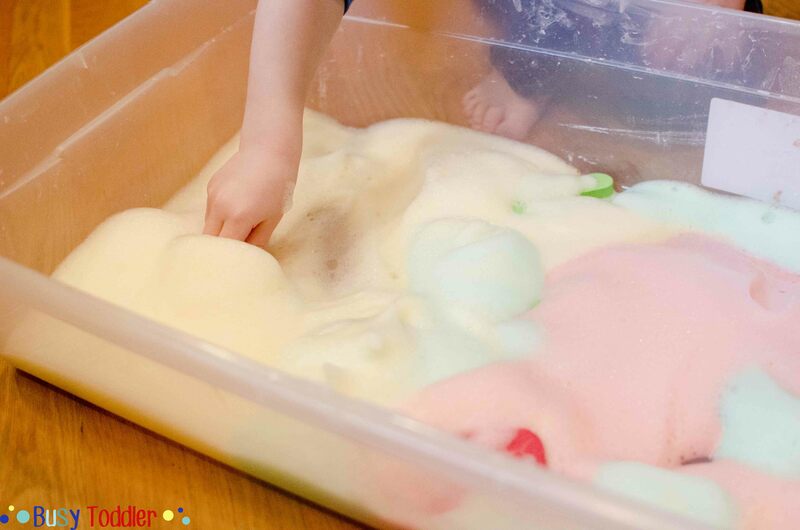 i can wait to to try this out with the kids…its something i can defiantly see them enjoying and will really help their sensory development!